The food of Venice is as much about fresh fruit as it is about fish. Peaches, pears, sweet cherries, figs, grapes, and melons perfume the market. Some simple poached fruit with cookies is all it takes for dessert. “We think Americans mostly like cake, but when we serve a fruit dessert like this one at Remi, everyone loves it.” Francesco admits. It calls for the sweetest, most intense cherries of the season, one of the fruits that Francesco says are as flavorful and richly perfumed in America as they are in Italy. When buying cherries look for those with flexible green stems and pick them out one at a time so none are bruised or have soft spots. Pit the cherries and set them aside. Place the almonds in a heavy skillet and toast over medium heat until they are lightly browned. Set aside. Combine the sugar, cinnamon stick, and wine in saucepan, bring to a simmer, and cook about 5 minutes. Add the cherries and cook about 15 minutes longer. Transfer the cherries and their sauce to a bowl and refrigerate 1 hour or longer. Whip the cream until soft peaks form. Fold in the amaretto and whip a few seconds longer. Fold in the mascarpone. Refrigerate until ready to serve. 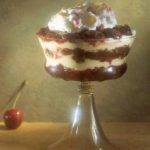 Spoon the cherries and their sauce into each of 4 goblets and top with the cream. 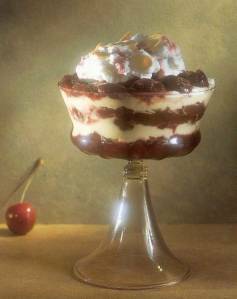 If desired, the cherries and cream can be layered. Top with the almonds and serve.